Deloitte’s headquarters is in New York. The firm has 182,000 employees around the world with a little more than 6,000 in France. But these figures relate, as well as the audit advisory activities. If we focus on consulting, Deloitte Strategy & Organization is the department to focus on. This department has more than 2,000 consultants in the United States distributed among 44 offices. The consulting business generates a turnover of nearly one billion dollars in the US. Deloitte was founded in 1845 in London by William Welch Deloitte. He was the first professional to hold the job of independent auditor for a public company, in this case a railway company. The history of Deloitte is rich in partnerships, affiliations, and mergers that have led to many changes of names for the institution at the discretion of the entries of new partners. 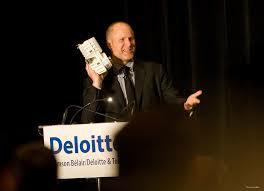 It was in 1947 that Deloitte started its activities as a management consulting firm. Mergers continue today with the acquisition of part of Bearing Point and Monitor last year. Compared to the practices of McKinsey or BCG, one notes that Deloitte is organized by function and by industry. This is due to clients referred by Deloitte consulting: conversely to McKinsey or BCG, which directly target corporate CEOs, while Deloitte consulting targets a level below. Similarly, Deloitte consulting clients’ portfolio generally consists of smaller firms, rather than top-tier strategy consulting firms. Nevertheless, Deloitte audit activities are very well introduced in the largest companies in the world. Then, to integrate the consulting entity of Deloitte, should one target the audit entity that has beautiful visibility in major accounts? It turns out that it is instead recommended to approach the consulting entity directly by one of its related sectors, such as human capital or technology. Note also that the Strategy and Operation sector is present in more than 75 offices in the world.